Brogo dairy farmer, Jess Pearce. Photo: TAFE NSW. A Statement of Attainment in Relief Milking is being offered in semester one at TAFE NSW Bega, a collaboration with Bega Cheese that aims to give local dairy farmers an extra pair of helping hands and perhaps the chance to have a break. 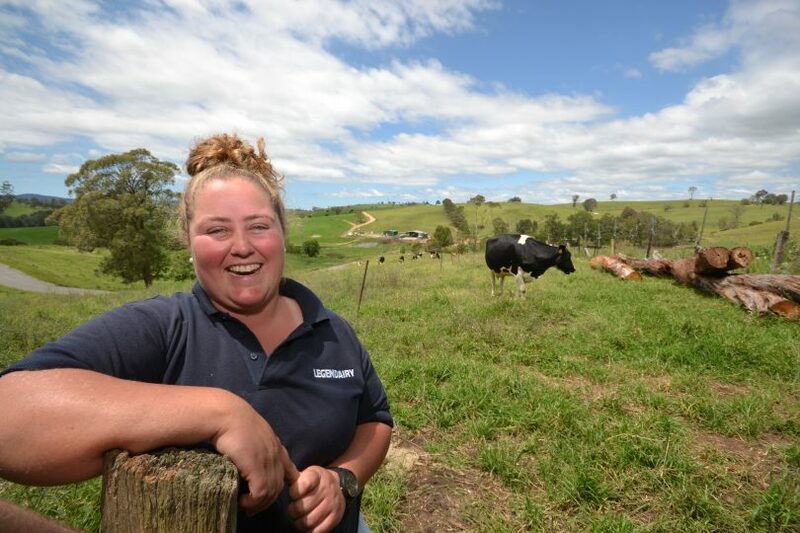 “You can enrol now to start the course on 15 February and could potentially have a job in the local dairy industry by the end of the month,” says Jennifer O’Donnell, TAFE NSW Animal Science and Agriculture Head Teacher. Ms O’Donnell says the short course has a proven track record among local job seekers. “There are people who completed this nine-day-course years ago and are still working in the industry,” she says. One of the reasons for the success is that Bega Cheese and TAFE NSW work to connect participants with farmers who need more employees. Brogo dairy farmer Jessica Pearce works on one of the region’s larger farms, Sunnyside, milking 300 head. “I love being a dairy farmer. I enjoy being outdoors, like the flexibility and love learning. We’re always learning such a wide variety of qualifications and skills at TAFE NSW and on the farm,” Ms Pearce says. Last year Ms Pearce graduated from Certificate III in Agriculture and is looking forward to semester one this year and continuing in Certificate IV in Agriculture. Sunnyside is a family-owned farm and while she enjoys the variety, Ms Pearce is very aware of how important it is for the local dairy industry to increase its workforce. “There is always a need for more people to work on local farms. Finding the time to take a break is one of the hard parts of this industry. Local dairy farms need a mix of casual and full-time employees,” she says. Australia is the fourth largest exporter of dairy products globally, and farmers in the Bega Valley and Eurobodalla play their part in that, with the demand for more workers real. So far the Relief Milking short course has been popular with a mix of people, from the long-term unemployed and school leavers through to those looking for a couple of hours work a week to help local farmers. Participants are taught skills in safety, milking management, quad bike operation, and electric fencing. Bega Cheese Senior Milk Supply officer Roger Went says people want the skills. “They want to be employable and this is an industry where you can learn a lot of different skills,” Mr Went says. “The nine days will involve a classroom session in the mornings and then out on farms for hands-on experience each afternoon. “And for those who want to take their agriculture career further, TAFE NSW Bega and TAFE Digital offer courses in Agriculture,” Mr Went says. Enrolments for the Relief Milking short course close on 15 February. For more information visit the TAFE NSW website or call 131 601.